A week after spilling its guts in a series of leaked slides, Lenovo has officially unveiled its Windows 8-running ThinkPad Tablet 2. The device has quietly been roaming around gadget conferences and far-off Internet channels for a while, but Lenovo is finally ready to unleash the tab in October, when it’ll go head-to-head against Microsoft’s Surface. That’s some tough competition. The 10.1-inch device sounds like it’ll fall into its business-minded niche just fine. Equipped with a 1,366 x 768 IPS display, Intel Atom processor, 8-megapixel rear camera (2-megapixel front), micro-HDMI,10-hour battery and optional 3G / 4G, the slate “marries incredible hardware and software to give consumers a great device for office, home or travel,” Lenovo said. In addition, the device measure in at 9.8mm thick, has an NFC radio and a fingerprint reader and pen, which can be slotted conveniently in the tablet. And, like most tablets these days, the ThinkPad Tablet 2 will support an optional keyboard, and also a dock with three USB ports, HDMI-out and Ethernet Jack. Lenovo didn’t mention a price, and merely said we can expect it to launch in October when Windows 8 hits. How much it costs will surely be a huge determining factor on whether or not consumers (and businesses) will pick this up. Hopefully we’ll know more when the release edges closer. RESEARCH TRIANGLE PARK, N.C. – AUGUST 9, 2012: Lenovo (HKSE: 992) (ADR: LNVGY) today unveiled its first tablet specifically designed for Windows 8, the ThinkPad Tablet 2. The multi-use tablet boasts differentiators that matter, including an optional digitizer and pen for precision input, 3G wireless with Lenovo Mobile Access pay-as-you-go plans and 4G models, along with security features like a Fingerprint Reader, IT manageability technologies, and corporate-level service and support. Technology like the multi-use ThinkPad Tablet 2 helps manage the increasing overlap between personal and work life today. Based on the upcoming Intel® Atom Processor-based mobile platform and Windows 8 Pro, the ThinkPad Tablet 2 works the way users do across their varied environments. It has an exceptionally thin and light design measuring 9.8 mm thin and weighing less than 600 grams (1.3 pounds), all in a 10.1-inch screen. The versatile tablet supports multiple input methods: multi-finger touch and an optional digitizer and pen, especially good for note taking, capturing signatures and completing forms. The optional ThinkPad Tablet 2 keyboard and dock can be paired with the tablet for more PC-like computing in the office. With an array of ports including a full-size USB port, workers easily can attach existing devices like monitors and printers. 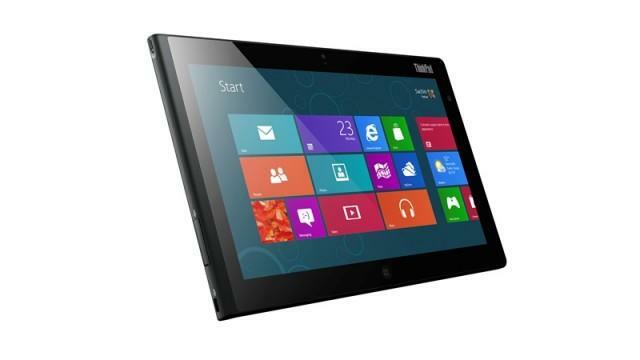 The ThinkPad Tablet 2 will be available when Windows 8 launches in October.